Please find this piece of information and contact me if you are seriously interested in participating and attending – we can have OUR EUROPEAN Club of Canada presence visible at this major event – a table could be reserved but all of you can pay directly to organisers. I’d like to extend my personal wishes to our Dear Friend – John (Janusz) Telesz to fast coming back to full health suffering a stroke after losing his lovely father Tadeusz in August. Now there is a time to get organised on another level – www.eurocanadanews.ca – domain name has been registered and just waiting to be put on digital platform in upcoming days and also in printed edition as a monthly publication on glossy paper. Advertising Team is in process of forming – those who are willing to start – a training is offered. ” The Sales People are the first to be hired- and the last to be fired” as Zig Ziglar used to say. Thank you so much for these days and years of co-operation but we have to speed up our efforts to move ahead – next year – we are celebrating 10th Anniversary of the EUROPEAN Club which I established with the Vision of doing grand projects – officially commencing the Celebration of the Europe Day in Canada. 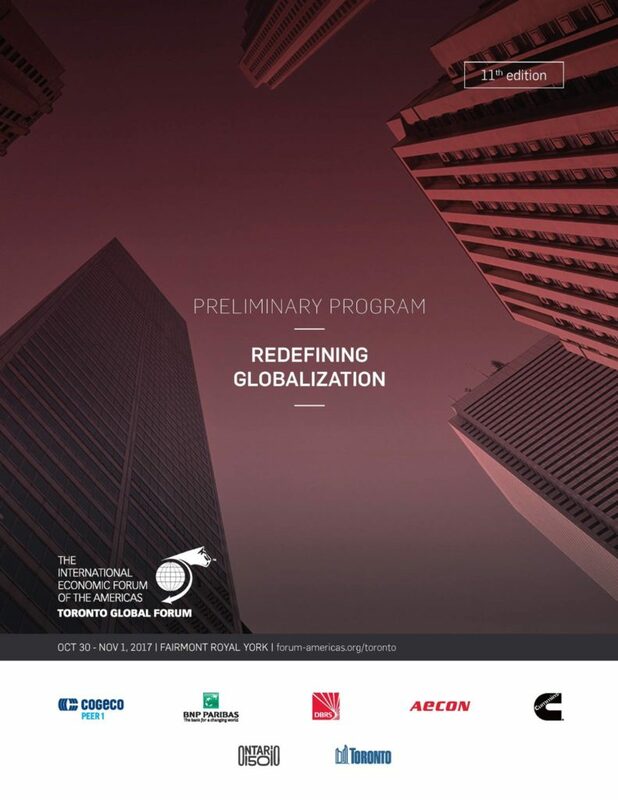 The regular pass at the Toronto Global Forum offers you privileged access to the many national and international speakers and the distinguished guests of the conference. This registration allows you to maximize your participation in the conference while offering an ideal environment to plan private meetings and build or develop your business networks. Daily networking times, a unique opportunity to meet with other participants. For registration related inquiries or to register by phone, please contact: Natalia Senkina at 1 866 865-2225 x228 or n.senkina@forum-americas.org. Totals are in Canadian Dollars and include all applicable taxes. The International Economic Forum of the Americas reserves the right to modify its current purchasing policy at any time without prior notice. *Special rates are also available to various organizations and institutions. Discounted rates are also available for students, teachers, academics, public sector employees and employees of not-for-profit organizations. For more information, please contact us at 1 866 865-2225 or at toronto@forum-americas.org. The IEFA accepts MasterCard, Visa, American Express, personal cheques and bank transfers. For more information or for technical assistance with making a payment, please contact us at 1-866-865-2225 or at toronto@forum-americas.org. In accordance with this Purchasing Policy, the International Economic Forum of the Americas does not provide refunds for tickets purchased for any of its events. However, if you are unable to attend an event, you may transfer your registration. All such requests must be made to an IEFA representative by email or phone prior to the event’s start date. Proof of purchase is required. Your registration may be transferred to a third party and may be used for other IEFA’s events. Please inform a representative one week before the event.